elevated platforms, mezzanines or ladder ways. employees go home safe each night. 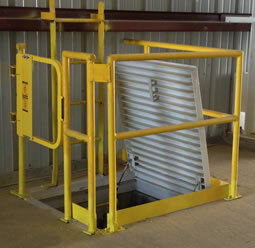  Adjustable to fit openings from 15" to 48"
Order gate at a size 2-1/2" smaller to account for mounting location.  Gate: 1-1/4", 11-gauge* square tubing. Minimum dimension from top of gate arm to bottom of gate arm is 22-1/4". 1-1/2" square. 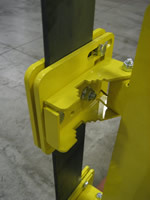 Bracket is adaptable to bolt to flat surfaces. 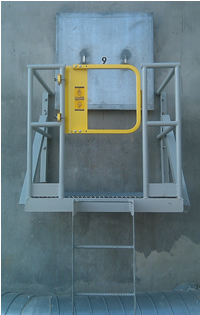  Hinge Plate: 10 gauge, full height of gate. 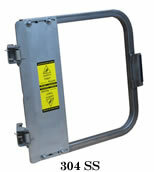 Hinge plate provides for gate adjustment of 3-3/4", (-)1-1/4" to (+)2-1/2".  Standard Hardware: U-bolts, flat washers, nuts and plastic thread protector cap.  Springs: Torsion type, stainless steel. Minimum of two (2) springs per gate, housed within hinge pivot. - Mild steel, powder coat yellow. Hardware to be zinc plated. - Mild steel, hot dip galvanized. Hardware to be zinc plated. - Stainless steel, 304-2b, unpainted. Hardware to be stainless steel type 316. - Stainless steel, 316L-2b, unpainted. Hardware to be stainless steel type 316, seal welded. - Aluminum, 6061, unpainted. Hardware to be stainless steel type 316. 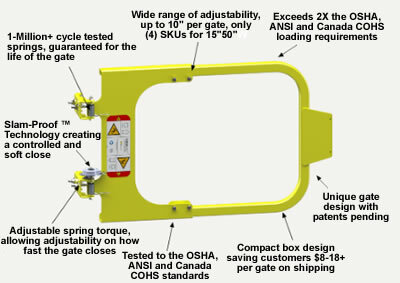  Gate Operation: Allows for 180° travel. 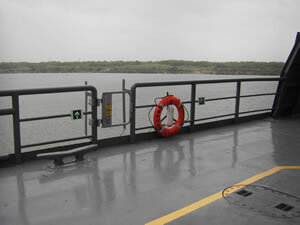 Gate swing direction is reversible by inverting or rotating.  Packaging: Carton includes gate, standard mounting hardware, and Installation/O&M Manual.  Warranty: 1 Year Limited. *Aluminum, 0.125 wall thickness. Stainless Steel, 16-gauge square tubing. 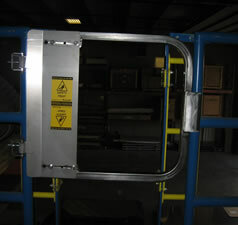 STAINLESS STEEL (316-2b) "Seal Welded for Food Processing"
than 2 O.D. up to 4 width. The maximum thickness capability of the FB-2205 is dependant upon the length of bolts. 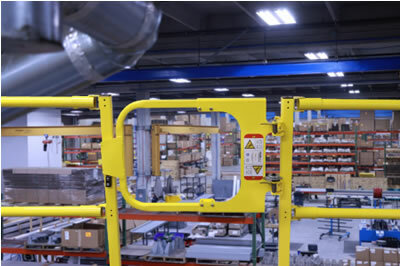 The standard FB-2205 includes bolts to fit a maximum thickness of 1/4. c. Angle Iron Adapter Bracket (AC-2206): The AC-2206 adapter bracket is for angle iron railing columns. 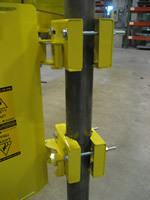 It fits angle iron with a maximum dimension of 3-3/4 x 3-3/4. 1. 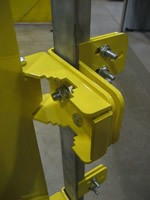 Powder Coat Safety Yellow (PCY): Hardware to be zinc plated. 2. 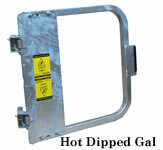 Hot-Dipped Galvanized (GAL). Hardware to be zinc plated. 3. Stainless Steel (SS): Type 316L. Hardware to be Stainless Steel type 316.
smaller to account for mounting location. Choose the LSG-21 from the Chart.